The Shop actively recycles all waste products. We also use energy efficient appliances where possible and use natural, pure essential oils. 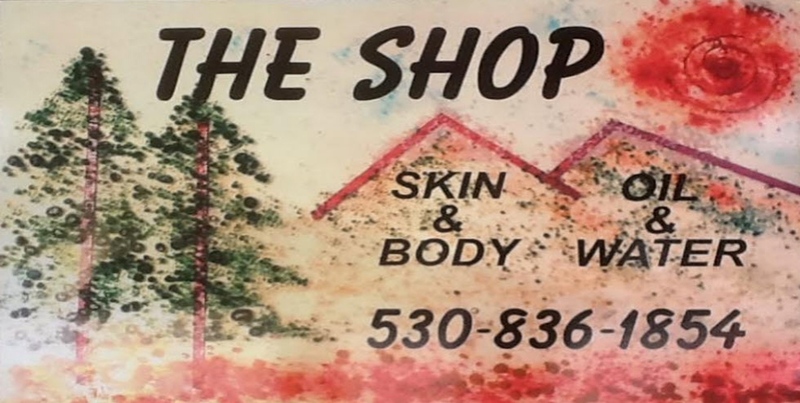 The shop is a cozy day spa in the heart of Dowtown Blairsden offering of a variety of professional treatment including Massage, Facials, Waxing, and more. Formerly, The Spa At Plumas Pines, we relocated to 315 Bonta Street in Blairsden and are beginning our 10th year providing excellent treatments for our guests. In addition to our spa treatment options, we also have an Oil and Retail room where we carry an array of non-chemical products made from pure therapeutic Essential Oils and are happy to customize for you. Our most popular items have been our Bug-Off, Muscle Therapy, Room Sprays, and Sinus Support and Thieves Cleaner We have kept many of wedding guests and visitors from being eaten alive! For our Skin Care Products, we are proud to offer Willa, formulated locally by one of our licensed Esthetician and Dawn Lorraine Conscious Skincare, a high-performance organic skin care line. Whether you are looking for a single appointment, a couple’s massage, or a customized spa party for your group, we are available to meet your requests. We can also set up at your location and have Gift Certificates too! Come be our guest, where you will be in the safe hands of educated professionals whose goals are to give you an excellent experience of relaxation and renewal. Experience a vacation within vacation!